Belt brushes are made from natural or artificial materials. Synthetic fibers can have different sections and colors. The working part can be made of material with varying degrees of hardness, depending on its usage. The fiber is mounted in the galvanized or stainless steel housing with cross-section of 5 x 5 mm; steel thickness = 0.6 mm. Brushes are made as straight, curved or twisted in various ways elements. Long sections are rolled in circles with a diameter of 700 mm. Use: in machine, wooden, chemical, electronic industry, as transporting, sealant, cleaning, separating or isolating. 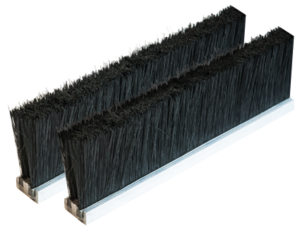 A batten brush mounted into an aluminum profile makes a typical sealant brush.